Labor Day is approaching, and school is back in session, or soon will be. Our eldest is a freshman in college, and our second is a junior in high school. My husband, Jimmy, and I have decades of experience as parents and as partners with the schools that they have attended. In my experience, any school's most important assets are its teachers. Yes, facilities, administrators, programs and parent involvement cannot be ignored, but the teachers are what matter most. That's because learning happens somewhere between the teacher and the student. I grew up in a household in which the teaching profession and teachers themselves were valued highly. My mother was a high school math teacher, and my father was an assistant college professor. My mother once told me how she had decided, in the 1950s, to become a teacher. "At that time, here is what females did: You could be a nurse, a teacher or a secretary." Her mother, a nurse, had told her she could not follow in her footsteps, which left her with two options. "I didn't want to be a secretary, so I decided to be a teacher." Mom continued: "Then I had to decide what to teach. The thing I was best at was math, so I decided to teach math." Her role model was a 10th-grade English teacher. "She was good; she was real, real good. She held the class together, so (the students) were involved and listened." Having had a good teacher, she understood that the criteria for success included being involved and interested in the students while holding the class together. She cared. Lance Ozier, a former student of hers who went on to become a teacher himself, related to me the impact my mother had on him. "As a small-town boy, I found it hard to identify role models, other than my parents and grandparents, who represented the kind of Renaissance guy I aspired to be. All of that changed the year I stepped into Mrs. Gingrich's 10th-grade geometry class. I knew she was different. She had lived outside of our small-town bubble, traveled the world, read great books and yet maintained a humility that invited you to be a part of her. She was also a fantastic teacher. ... She meant business in her class, but never at the expense of the human element. She cared. And everyone knew it." But the future of the profession is not so bright as it should be. This week, the 50th annual PDK Poll of the Public's Attitudes Toward the Public Schools was released. The poll, conducted in May, asked 1,042 American adults "about a range of issues confronting education, including teacher pay and the teaching profession, school security, options for improving the public schools, perceptions of opportunities for different groups of children, college affordability, the value of a college degree, and school schedules," according to the news release. Shockingly, less than half of parents said they would want their children to become a teacher. 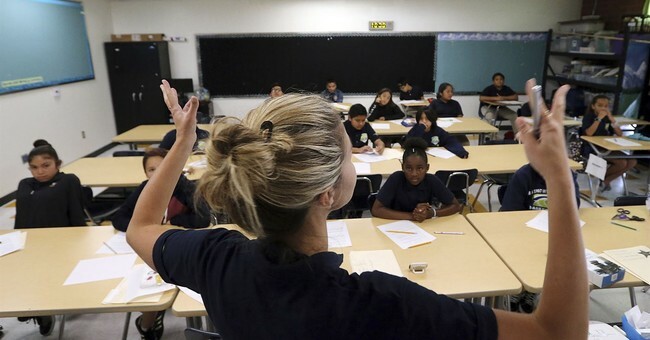 When the poll first asked that question, in 1969, 75 percent of parents said they would support one of their children being a teacher; by 2009, that percentage had dropped to 70, and now it rests at 46. Teaching used to be one of the few career paths available to women, but the current landscape offers them more career paths. Many of those alternative career paths pay better than teaching. The poll results included "remarkable support for improving teacher salaries. ... Two-thirds of Americans say teacher pay in their community is too low; just 6 percent say it's too high. An overwhelming 73 percent say they would support teachers in their community if they went on strike for higher salaries, including about 6 in 10 Republicans." Investing in teachers equals investing in the future of our nation. We have to support and encourage our teachers and give them the respect they deserve for educating children who will create the future of our country. If we ignore this crisis, then we do so at our own peril; if we don't want our own children to become teachers, what does that say about our respect for those who do? As a nation, we need to be more creative about recruiting and retaining teachers. As we shift from having one career to having many over our lifetimes, we have to think about how we can recruit new teachers, even if they don't make it a lifelong career. For teachers to care about our children, we first have to care about them.